Homemade Vegetable Potstickers with Toasted Sesame Honey Soy Sauce. Homemade Vegetable Potstickers with Toasted Sesame Honey Soy Sauce!! Homemade Vegetable Potstickers with Toasted Sesame Honey Soy Sauce from Half Baked Harvest on Vimeo. 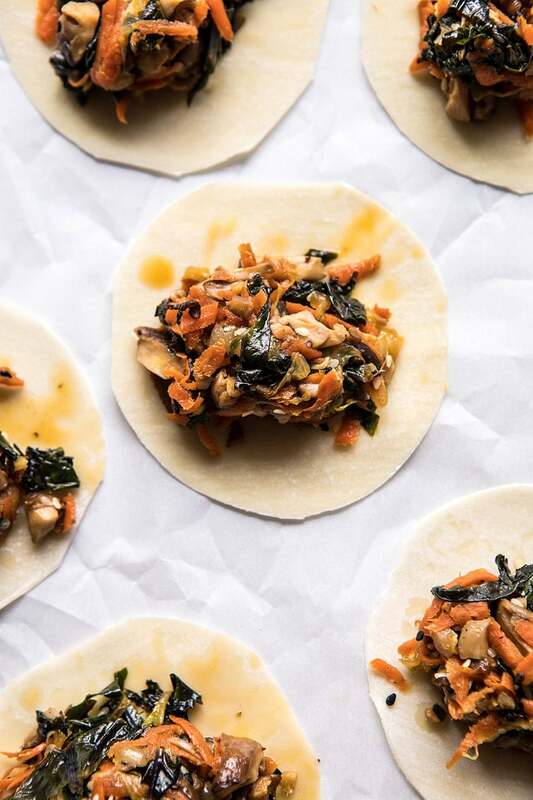 I made homemade potstickers and they are seriously the best thing ever…and with all veggies too! Oh my gosh…I love these. Question? Did you guys grow up eating potstickers from the freezer isle? Because I did, potstickers and Perogies. Both were recurring after school snacks (and sometimes dinners) when I was a kid, my mom and I loved them. Especially with a side of soy sauce. Yum. Seeing as I now have a recipe for Homemade Perogies on HBH, I thought I should probably have a recipe for homemade potstickers too. I mean, it just seemed like the right thing to do. And it is. 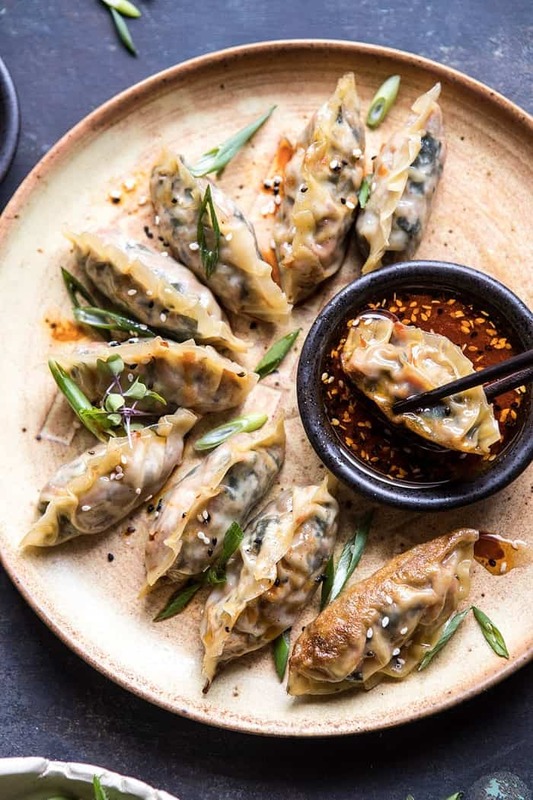 I know Homemade Potstickers might sound scary, and you’re probably thinking these are too hard to make, but the truth is that they’re relatively easy, and actually somewhat fun to make. Not to mention the fact that these are a million times better than anything from the freezer section, and healthier too! I made my potsticker filling out of veggies, which I personally think is way better than ground meat. The vegetables add flavor and color, which you guys know I am all about. I used mushrooms, cabbage, and carrots, but honestly, any mash-up of veggies would do. Broccoli, brussels sprouts, and kale would all be awesome. I seasoned the veggies with a touch of soy sauce and used a ton of ginger and sesame to kick things up a bit. I then pan-fried them and served them up with the most delicious sauce, because in my opinion you can’t serve potstickers without sauce. You just can’t. 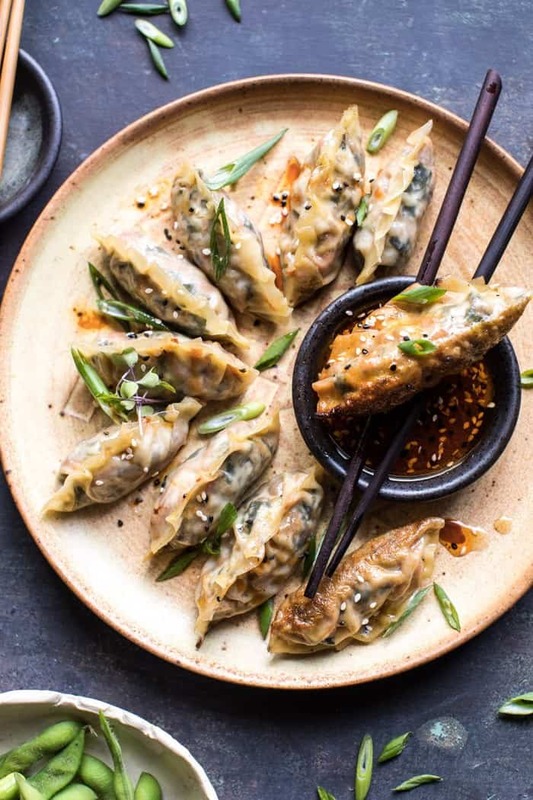 When I was a kid, mom and I would eat our Potstickers with a little soy, but I decided to have some fun and create a sauce loaded with flavor. Enter my Toasted Sesame Honey Soy Sauce. 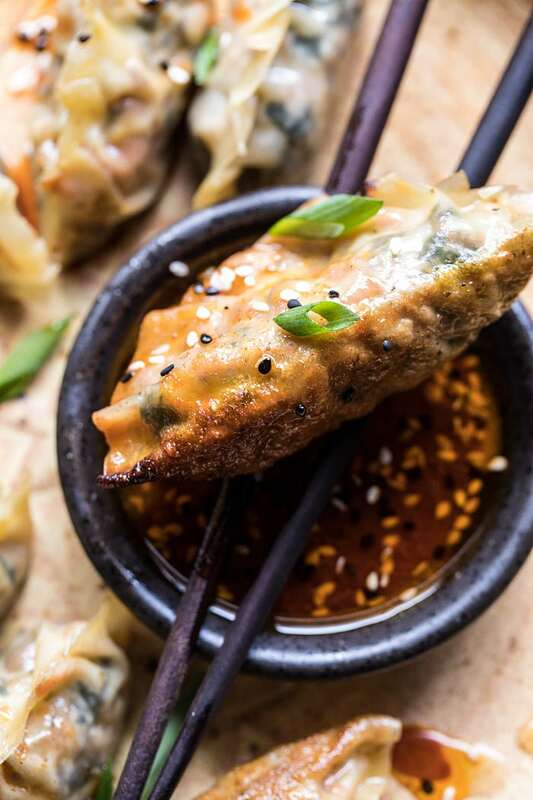 It’s sweet, a little spicy, and a touch salty, which if you did not know is the perfect combo and the best accompaniment to these homemade potstickers. Preferably sometime soon, like maybe this weekend? Or maybe even tomorrow night for a little 2018 Winter Olympic Opening Ceremony celebration dinner. Yes, yes, you should! Invite friends over, make potstickers, and watch the Opening Ceremonies (they will replayed tomorrow night at 8:pm EST on NBC…PyeongChang is 14 hours ahead of EST). You can cheer on my brother Red, his friends, and the entire US Snowboard team. YES, DO THAT! Here is a link to the entire broadcasting schedule of the Olympics. If you want to watch live, you’ll need to livestream. Here is a link to a free trial on Fubo TV. Red competes live at 8:00 pm EST on Friday night the 9th, or watch the replay the next morning on NBCSN at 9:15 am EST. If Red makes finals, he will compete live at 8:00 pm EST on NBCSN. As you guys are reading this post, I should be somewhere over the Pacific Ocean and well on my way to South Korea. Not going to lie, kind of freaking out a bit as I type that. This is the farthest I have ever traveled, and only the second time I have ever been out of the USA. The first time was to Mexico, which was only a two-hour flight from home I almost feel as though that doesn’t even count. Anyway, the Korean adventure to the 2018 Winter Olympics has officially begun. It’s going to be a crazy week ahead, but I’m excited and so happy to be here with my family and even more happy for the reason we are going. Still can’t really believe it, but Red’s an Olympian now, and I cannot wait to cheer him on, and his friends (some of which feel like family members as well). Don’t forget to follow along on Instagram!! 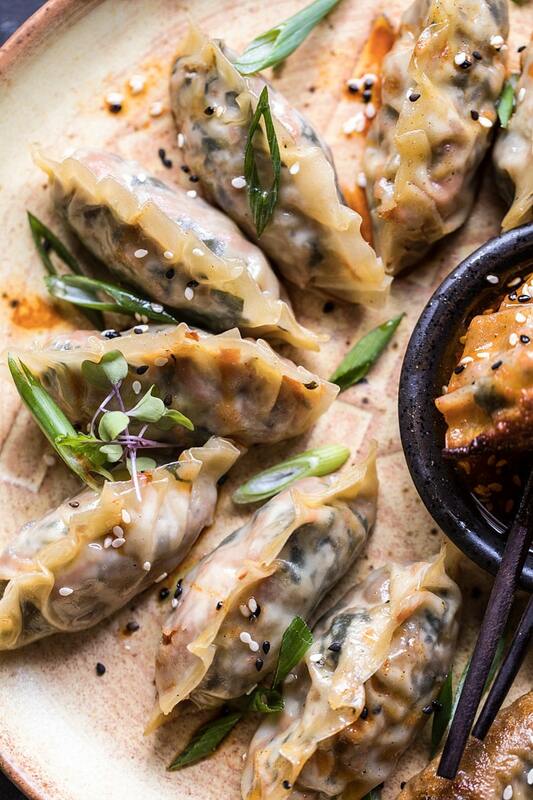 And then, make these Potstickers tomorrow, take a photo, and tag me on Insta so I can see! Relatively easy to make, and actually somewhat fun. Plus these are a million times better than anything from the freezer section...and healthier too! 1. Heat 1 tablespoon sesame oil in a large skillet over medium high heat. 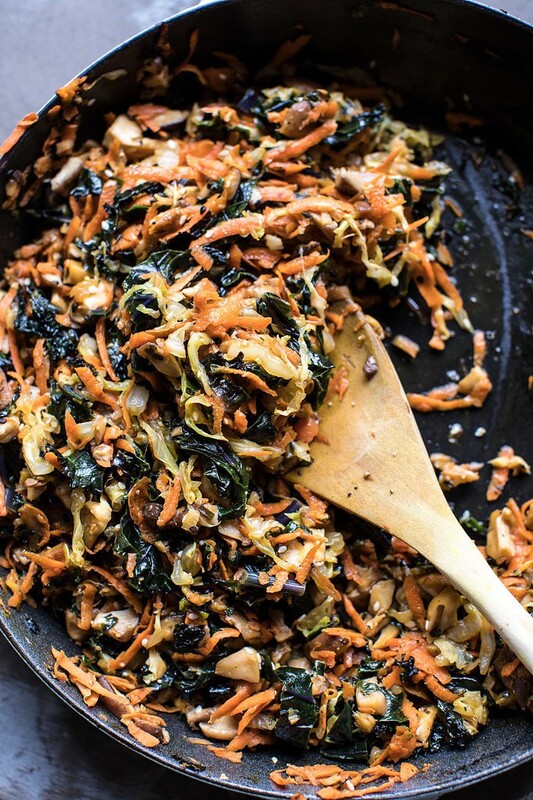 When the oil shimmers, add the mushroom, cabbage, carrots, and ginger. Cook, stirring occasionally until the veggies have cooked down, about 5 minutes. Add the soy sauce, chives, and sesame seeds and cook another 2-3 minutes or until all the liquid has evaporated. Remove from the heat and let cool. 2. To assemble, spoon 1 tablespoon of filling onto each wrapper. Brush water around the edge of the wrapper. Fold the dough over the filling to create a half moon shape, pinching the edges to seal. Repeat with the remaining wrappers. 3. Heat a large skillet with the remaining sesame oil over medium-high heat. When the oil shimmers, add the potstickers and cook until the bottoms are light golden brown, about 2-3 minutes. Pour 1/4 cup of water into the pan and immediately cover with a tight fitting lid. Turn heat to medium and let the dumplings steam for 3 minutes. Serve immediately with sauce (se below). 4. To make the sauce, whisk together all ingredients in a bowl. PS. these are also highly addicting. Just saying. 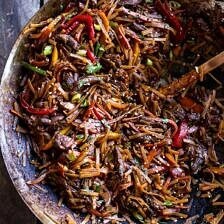 30-Minute Stir Fried Korean Beef and Toasted Sesame Noodles. Lol, you are just A LITTLE big excited about those game, just can tell from your post 🙂 I hope you had a fun flight, it’s easy to fly now with personal screens and selection of movies games, with food coming every couple hours 🙂 Can’t wait to hear all about South Korea! And thank you for doing all the work for us– it has been on my to-do list to find snow boarding competitions times on TV, and you have done it for us!! Will be cheering for Red!! Good luck!! Thank you so much Nikki! I cannot wait to share with you guys everything I have already done! Thanks for this recipe! I’m a pescatarian and it’s difficult to find good veggie potstickers in the store. I could feel your excitement for your brother through your writing and it brought a huge smile to my face! I pray he has success and safe travels for all. Go USA! I hope you love this Lisa! Thank you so much! One of our favorite things to make at home – I can’t wait to try out this veggie version! As a side note, and I know it’s rare to have leftovers with potstickers, but hubby and I do, in fact, have leftovers. 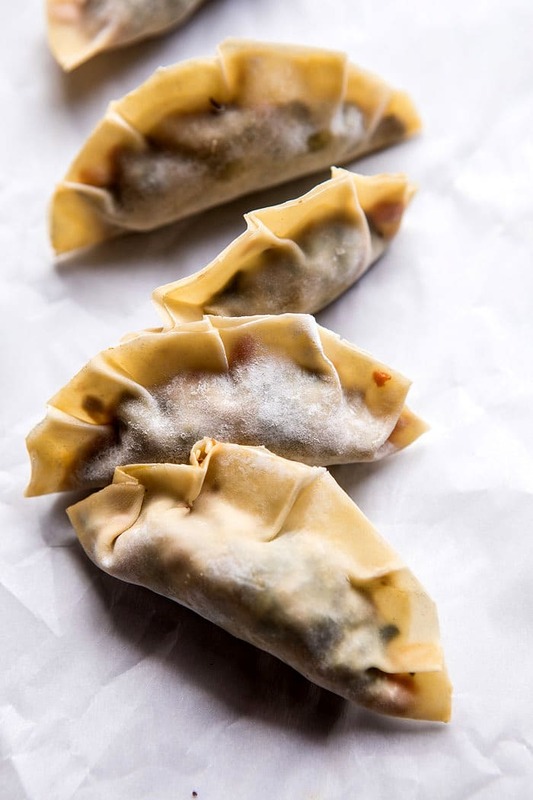 Pop the potstickers into the freezer on a half size cookie sheet and freeze individually then toss into a gallon size freezer bag. They don’t even need to be thawed when you’re ready to cook them! Just pull out as many as you need and fry/steam. Thanks! I was looking for comments on freezing. Yes they’re so easy to freeze and have for later! I hope you love these Lori! Thank you! Holy crap. I usually have to be tricked into eating vegetables, but I think I can chop these up fine enough to not notice all the vitamins and minerals and fiber, haha. Great recipe! 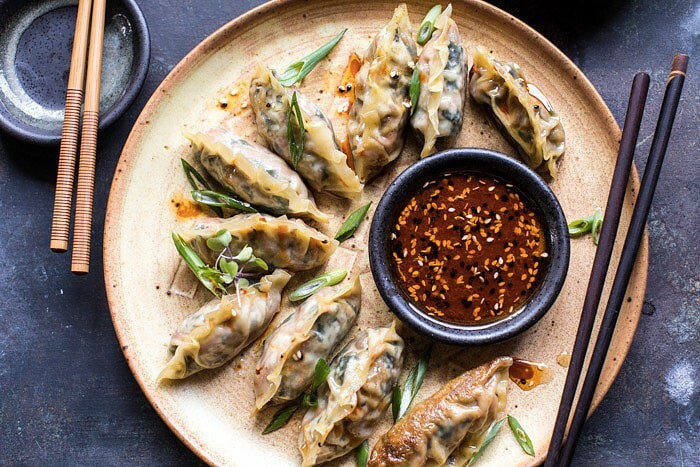 I love these potstickers and was just looking for a recipe for veggie potstickers! 🙂 my mom and I used to eat them too. Maybe I can make these when I visit. Thank you Kristin! I hope you love these potstickers, let me know how they turn out! Gomabseubnida Louise! So glad you’re watching! These look delicious! Any suggestions for making them Gluten Free? I haven’t seen any GF wonton wrappers but was thinking maybe rice paper. your brother totally killed it on slopestyle! congrats! your fam with the face posters, so awesome. :) enjoy the games! Thank you so much Stephanie! We are so proud of him! I just watched your brother win Gold tonight!!! 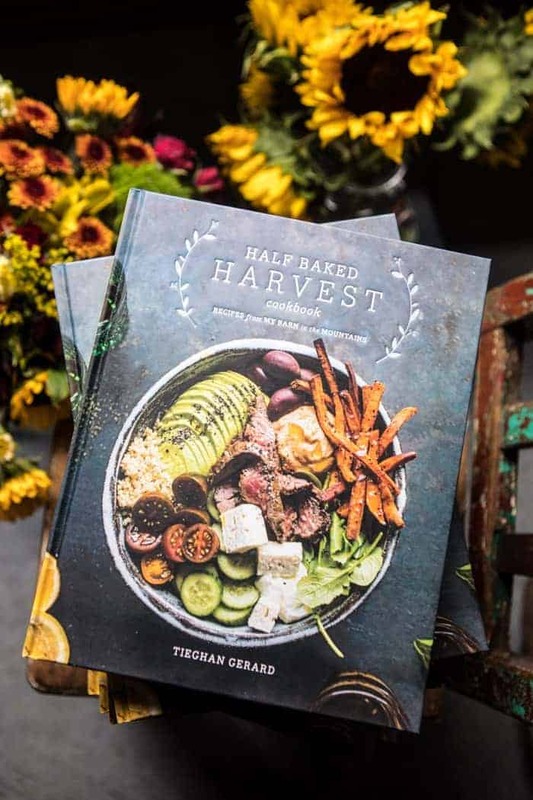 i am a Rhode Islander and I loved seeing he had a sister with a food blog! 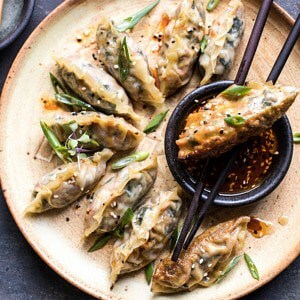 I love making potstickers and can’t wait to try your recipe! The spicy chickpeas looks wicked good, too! Best of luck to your family in Korea. 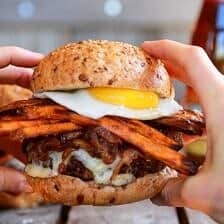 I hope you love this recipe, Laura! So glad you watched Red! I am so proud of him!! Can’t wait to try this recipe. Quick question: What is the dark leafy vegetable that you show in your pictures? I can’t tell which one of it is from you ingredients list. Congrats to your family for the gold! I was wondering the same. Not the greens on top but the dark greens in the photos of the filling. It looks like Kale? These look delicious! It’s usually hard to find vegetarian potstickers. Can you make them ahead of time and freeze them? Or make them and refrigerate them for a day or two? Thanks!! We had this last night as we were watching your brother win gold! Shredder! Congratulations and this recipe was delicious! So glad you liked these! Thank you so much Sarah! Just made these tonight, they were super delicious! I tweaked the recipe a little. I doubled the mushrooms and I added an extra tsp of soy sauce to the filling. I also added more soysauce to the dipping sauce and I reduced the sesame oil because a 1/4 seems like a lot of oil. I also used sugar instead of honey because I find honey doesn’t mix well when it’s not heated. Sounds amazing! Thank you Becky! its amazing it gives me more information then others. keep it up. Hi! 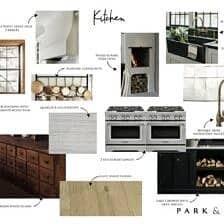 I love your cookbook and your recipes I have made so far. 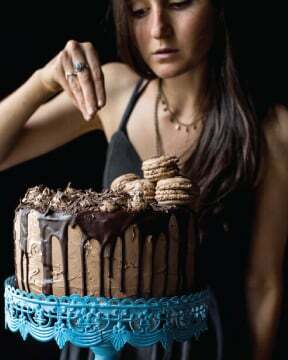 I am dying to make these for a gathering this weekend. Do you think I can cook the veggie filling the night before (and stick in the fridge) and assemble with the wonton wrappers and cook the following day? Thanks! Hi there! These look delicious. Did you add kale to the filling in the photos? I was thinking of kale as well. 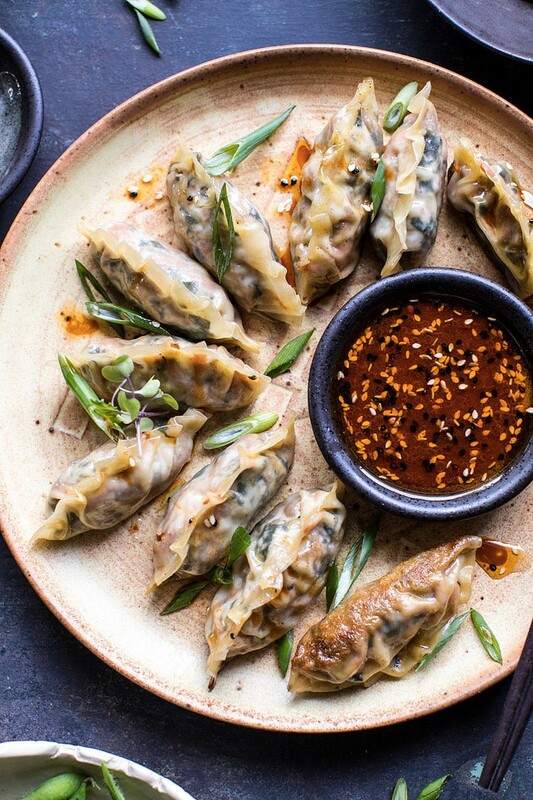 Wow, these potstickers look so incredible and I can’t wait to try this recipe. I’m literally salivating right now! Question: What is the dark green veggie in the photos? 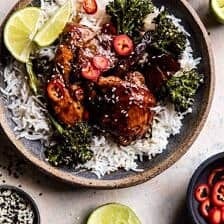 It looks as though it’s missing from the video and the ingredient list, but it looks delicious in the photos and I’d love to add it in! I’d like to make these as an appetizer to take to a dinner party. Any suggestions on reheating them when I get to my friends house? Quick pop in the broiler maybe? As with most Asian-inspired dishes, this one requires some up-front prep that can be time consuming – but it’s worth it. These are very tasty. I used little square wraps, so my pot stickers were little triangles instead of half moons, but they cook up just the same. Give yourself an hour-and-a-half if this is your first time making these little morsels, and be careful not to pack too much filling into those wraps. It takes surprisingly little to make them perfect. 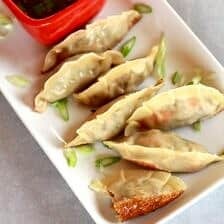 I just made these pot stickers and they were AMAZING! I trying to stick to a plant based diet and these fit the bill. Thank you for the recipe! I am so happy to hear that Lorelei! Thank you!! 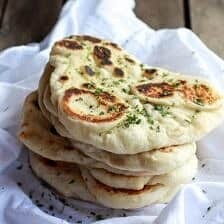 I made these today and brought them fresh from the pan to pick my son up at school. He proclaimed them “the best ever”!! Thanks for another delicious recipe. I am so glad he loved these! Thank you so much Danielle! Tried these last week. Did not like them as the recipe calls for but I guess it is personal preference….we did not like the pot stickers steamed. the next day I used the leftovers to make them and I fried them until they were nice and crispy….they were very good done like that. We dipped them in Sweet Chili pepper sauce. Hi Bobbi! I am glad you liked this recipe when frying the potstickers! Hi! 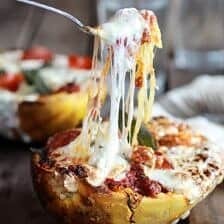 I am going to make these this weekend and bring for lunch to work for the week. Can I reheat them in the toaster oven? I assume that might be better than the microwave. Also, what wonton wrappers do you recommend? There’s a big Asian grocery store close to me so there are a ton of different options. Thanks! Is it Napa cabbage you use? Cabbage can mean a lot of different varieties. 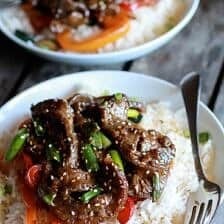 Great recipe — I believe there is a miscalculation in the sauce, 1/4 cup sesame oil is way too much.